What Is The Definition Of Arrow Rest In Archery? 1. This is the part of the bow where an arrow is cradled as the bowstring is drawn. It is designed to keep the arrow stabilized for proper aim. There are different types of arrow rests, including those that drop away shortly after the bowstring is released and delicate rests designed to produce minimal interference and sound when shooting. 1. 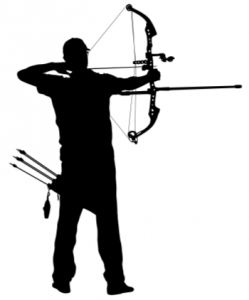 The archer is commenting about the grouping of his arrows and is thinking about adjusting his arrow rest to see if it helps them fly straighter.